Intense. Earthy. Deliciously compex. Perfectly balanced. A-List Communications and Sponsors Conair, The Sky Lodge, The Wrap.com and Premiere.com team up with the Creative Coalition and celebrities to bring national attention to the arts in order to ensure they thrive and flourish in America. Photos taken by Pulitzer Prize Winning Photographer Brian Smith and world renowned celebrity photographer Tom Concordia. Celebrities include Katie Holmes, Kristen Stewart, Amanda Peet, Dakota Fanning and others. When David and Maryann Johndrow talk about how they came to be in the movie business, they have a very clear and succinct take on the process. "It's about great relationships," David says. In the Johndrows' case, excellent wine helps too. "We are competing with people who have been in the wine business a lot longer. It's been a lot of fun." First-time executive producers are Edmond native David Johndrow, 42, and his wife, Maryann Johndrow, of Johndrow Vineyards in Napa Valley. The couple join several executive producers. David Johndrow said the entire movie will be filmed throughout Oklahoma City and metro areas such as Edmond, Guthrie and Luther. Tulsa World also picked up this story. Visitors to Haven 360, HFM Media and A-List Communications’ Awards Week celebrity experience venue at the Andaz West Hollywood, got more than the usual gifts and entertainment. They also sampled fine wine—and took some home—courtesy of Johndrow Vineyards owner David Johndrow , who was on hand personally pursue his mission to help celebrity wine lovers “find your happy place.” And that place was the wine lounge at Haven 360. Drinking wine is an art that is perfected with time. It requires knowledge, sophistication and heightened senses to enjoy the full experience. But if you have not yet entered the world of wines, do not be deterred. This guide will equip you with all you need to know to hang out with your wine-aficionado friends. For California's wines to compete, vineyards will not only have to lower prices, but market more aggressively, says David Johndrow, who owns Johndrow Vineyards in the Napa Valley town of St. Helena. No longer can they rely on reputation alone. Johndrow remembers being frustrated when a favorite $35 wine suddenly spiked to $150 or when a good review created an overnight "cult" wine only obtainable via exclusive waiting lists. "We have to put the consumer back at the center," Johndrow said, not cop an attitude that "I have the wine, come kiss my ring." The Oklahoma State University School of Hotel and Restaurant Administration and Chesapeake Energy will host Cochon 555, which starts at 4:30 p.m. Saturday in the ConocoPhillips OSU Alumni Center. The main event will be preceded by a VIP tasting, featuring artisan cheeses and wine from Johndrow Vineyards, owned by Edmond’s David Johndrow, plus samplings from Owen Roe Winery, Dobbes Family Estate, Paul Hobbs Winery, Auteur Wines, Joel Gott Wines, R. Stuart & Co. Winery, Orin Swift Cellars, Shafer Vineyards, Odisea Wine Co. and Darms Lane Winery. Chef Matthew Harris, from Park City's J&G Grill (located inside the St. Regis Deer Crest Resort) will compete in a regional "COCHON 555" competition in Stillwater, Okla., on Saturday. The contest is one of 10 regional events taking place throughout the country, each featuring five chefs, five pigs and five winemakers. Each chef will use a whole pig to create a series of dishes for the contest, designed to promote heritage breed pigs. Harris will use a 150-pound pig from Provo's Clifford Family Farms. David Johndrow, owner of Johndrow Vineyard and a Park City resident, is one of the five featured winemakers. Judges and guests will determine the winner based on how well the animal was utilized, presentation and flavor. The winner will compete in the Grand Cochon competition, held during the Food & Wine Classic in Aspen, June 18-20. 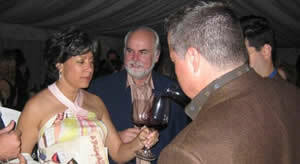 Johndrow Vineyards Makes a Tasty Splash at Celebrity-laden Event! Originally from Oklahoma, David Johndrow, moved to California to build a vineyard and start a winery whose mission was to present great wines at reasonable prices to help wine lovers find enjoyment in wine-drinking. The Napa Valley winery Johndrow (JV) Vineyards, made its debut in 2005 with JV Red Wine. Oklahoma City entrepreneur David Johndrow recently arrived back in town after a week in Los Angeles at the Academy Awards. He was there serving his Johndrow Vineyards wine for the preparties for the movie "Precious,” documentary "The Cove,” director Lee Daniels and the Golden Trailer Awards. Johndrow Vineyards found its Happy Place at Haven House during its Oscar Week gifting lounge hosted this year at L.A.’s Andaz Hotel. HOLLYWOOD, CA (Hollywood Today) 3/13/10 — As everyone settles back to normal after Sunday’s Academy Awards, I am coming at you with a wine item for Johndrow Vineyards, the official wine of HFM Media’s Haven 360 at the Hotel Andaz West Hollywood. 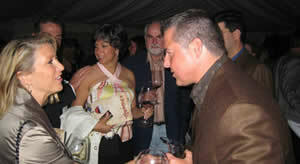 The Hello Dollface blog post, “Gifting Lounges for the Oscars!” mentioned Johndrow Vineyards wine. Johndrow Vineyards’ Clarity and new Reserve wines were recently reviewed by SinninginLA.com. For the second year in a row, David Johndrow from Oklahoma City, owner of Johndrow Vineyards, was invited to pour his Napa Valley wines at the Sundance Film Festival. David Johndrow appeared on KAUT’s Rise and Shine to speak about the Sundance Film Festival and charitable giving. When David Johndrow sold his tech business, he needed a new outlet. So he turned to his favorite hobby — wine. Soon that hobby became a business when Johndrow, of Oklahoma City, began Johndrow Vineyards from his vineyard in St. Helena, Calif. In terms of vintners, Johndrow is still the new kid on the block. But in record time, he's achieved major market appeal and respect in the industry. He was selected, for the second year in a row, as the exclusive winemaker for the Sundance Supper Club at the Sundance Film Festival in Park City, Utah, which came to a close on Monday. OKLAHOMA CITY – Old career advice: Don’t burn bridges and network like crazy. New career advice: Continue with old advice, but use existing career skills to leverage and market your new venture. As today’s work force changes and people strike out as entrepreneurs or shift from one type of work to another, many are finding that skills from their previous jobs are coming in quite handy. David and Maryann Johndrow of Oklahoma City spent four-and-a-half years as owners of HRLogix, a technology company that sold a human resources application tracking system. 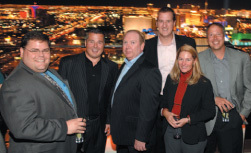 Anyone who applied online for a casino job in Las Vegas did so using the technology the Johndrows built from a scratch. About two years ago, the couple sold HRLogix to a Florida company in order to start their own wine label, Johndrow Vineyards. That’s when their technology and marketing skills gave a boost to their wine. The Chalkboard Announces "Johndrow Wine Dinner"
The dinner will be held on July 28th, 2009 at 6:30 p.m. at The Chalkboard. Johndrow Vineyards California Cabernet and Reserve cabernets both earned honors in the 2009 cabernet issue of Connoisseur’s Guide to California Wine. Both wines, vintage 2006, earned a rating of 88, outscoring notable cabernets such as Grgich Hills, Franciscan and Spring Mountain Vineyard by two points each and Stags Leap Cellars Artemis by three points. Among their honors, the Johndrow cabernets received one star each, placing them in the outstanding wines category and marking them as a “fine example of a type or style of wine” from the rater. Both cabernets are medium reds, pairing best with beef and lamb. Johndrow Vineyards was recently selected as a 2009 winery for Red, White and Snow, the premier fundraiser for the National Ability Center. Companies pair their offerings for prestigious opening weekend party. Johndrow Vineyards made news this month with features in Tulsa World, The Oklahoman and The Oklahoma Gazette. Johndrow Vineyards made it's debut in 2007 with JV Red Wine. Riding the coattails of the success of JV Red Wine comes the release of three new wines, JV Reserve Cab, JV Cabernet and JV Clarity. Limited availability in select locations. Gaming & Leisure loves JV! Click here to view Johndrow in the latest issue of Gaming & Leisure Magazine. Johndrow Vineyards is a sponsor for the National Ability Center’s (NAC) upcoming fundraiser, Red, White and Snow 2008. Red, White and Snow is a 3-day culinary, wine and ski festival to benefit the National Ability Center. The NAC provides adaptive sports and recreational opportunities to people with disabilities and their families. Founded in 1985, NAC offered 45 ski lessons in their first year. Since then, NAC has grown to provide more that 26,500 lessons is 22 different programs. Click here to view the first segment. Click here to view the second segment. Click here to view the third segment.